I love sleeping on deck! With not a hint of rain in the forecast, the forward cockpit was my chosen sleeping location! A cushion from the main salon, a sheet, pillow and blanket and I was set. Looking out at the brilliant stars each night and waking just before dawn...those were special times for me. Still, quiet with just a gentle slap of a tiny wave on a hull, a faint splash of fish jumping, paradise! And oh, the sunrises! Mind blowing! Each morning, as people started to stir, we fired up the generator for coffee and an hour or so of charging, not just the boat batteries, but all the electronics - phone, iPads, cameras! Every outlet put to full use! Our next destination was Hatchet Caye, where we planned to spend two nights as there is a protected area we wanted to go. Silk Cayes Marine Reserve is a protected area on the reef and we were required to have a guide onboard to enter the area. We arrived at Hatchet mid-afternoon and once again, it was everyone in the water! Who can resist the warm Caribbean sea? Then, after a little beauty party! It was all ashore for dinner. From bikinis to dresses, a touch of makeup and we had a full boatload of glamour girls! 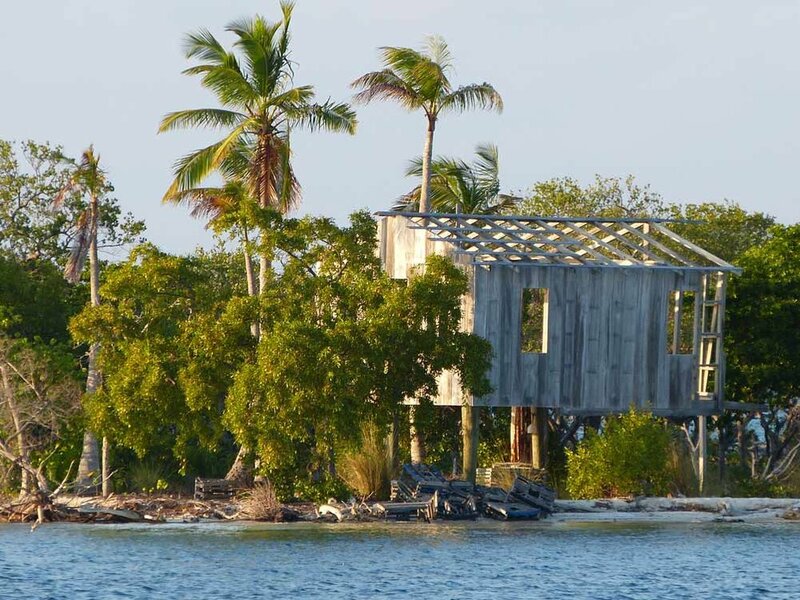 Hatchet Caye is a private island and we had called ahead for dinner reservations. The open air restaurant and bar is so Caribbean, and the drinks so wonderful, I think if we hadn't had plans for moving on, many of our crew would have been happy to stay for the remainder! Next morning, on the dot at 9 am, we met our guide Eyanick Pop, who would direct our anchoring and accompany us as we explored the Silk Cayes. A short motor out to a dot on the horizon took us to another little paradise. Our biggest issue was anchoring in extremely shallow water. We watched the depth sounder with trepidation as the water got shallower and shallower. But Eyanick knew what he was doing, and we anchored in what seemed like less-than-wading-depth water. When we knew the anchor was set, once again it was "Everyone in the water." We followed our guide as he snorkeled over the coral, pointing out the various fish and picking up a beautiful conch to show us! He carefully replaced it and we snorkeled on. Later, we dinghied over to the tiny caye. These minute islands and the waters surrounding them are really indescribable - this is a classic example of "You had to be there." The colors, the fish, the coral and the feel of the water took me to another world! Even the photos really don't do it justice, just convey an inkling of what it is really like! But there were indications of other visitors to the caye who were not as caring about the environment as we are, so we rallied and did a quick beach clean-up, netting plastic bottles and broken bits of Styrofoam. And fresh rubbish that someone had left very recently! Our good deed done for the day, back to the boat and up anchor to go swim with the sharks, rays and loggerhead turtles! What a treat that was. It was also the only place where we had run into more tourists out snorkeling, but the big fish are a big draw. Once anchored, over we went in amongst the fish! Rays flew by us, there expansive wings undulating; nurse sharks cruised along the bottom and then... a huge loggerhead turtle appeared and he obviously owned the area! "Give him space, give him space," Eyanick implored! This big guy was guesstimated to be between 50-75 years old and has been know to nibble toes! But, oh what a treat this was! It is an amazing feeling being in the same environment as these animals, yet knowing that you are the intruder! Back at Hatchet, we picked up our mooring again and several crew went ashore, but I stayed behind onboard, enjoying a bit of solitude after another amazing day. Older PostEndless Estrogen Goes Boom!